Miniature golf has provided fun for children of all ages for several decades, and its popularity does not appear to be waning. Grandparents as well as little ones can feel adept at “golfing” with each other. 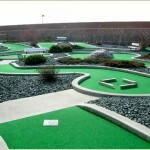 Such courses offer a wonderful opportunity for wholesome family fun as well as safe entertainment for teenagers, church and social groups, birthday parties, dating couples, and “old married couples.” Most courses offer opportunities for all levels of players to feel successful and even score a hole in one. Risk management practices for miniature golf courses General Liability insurance policies include proper maintenance and inspection of the courses, clubs, and golf balls; careful and regular inspection of lighting and electrical supply areas with posted signs to keep out; sufficient and proper lighting; protection and signs around water areas; proper supervision all players, especially children and inexperienced golfers; posted evacuation plans in case of inclement weather; posted rules of conduct; careful background checks of employees who will work with children; CPR training and first aid equipment; and careful and regular inspection of course maintenance equipment. Golfers should be prohibited from using the facilities without proper equipment and supervision when necessary. Even with careful attention to detail, accidents, lawsuits, and resulting General Liability claims can occur at a miniature golf facility. Players can slip and fall on a wet surface or a slope, golfers can be accidentally hit by a club (or errant golf ball); players(especially children) can fall into the water; lightening can strike a player; people can trespass into posted areas and become electrocuted. The best protection for yourself and your miniature golf course is to have both Accident and General Liability insurance with sufficient limits for proper coverage in the unfortunate event of a lawsuit.